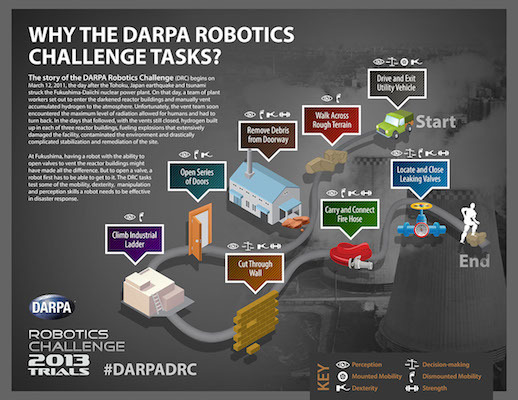 The DARPA Robotics Challenge (DRC) was created to encourage robot companies to think of innovative designs for robots that could respond to disastrous situations that responders could not. As part of the NIST team, Robolit, continues to contribute to the DRC test site design effort. The DRC stage is set up to be a repeatable, reproducible test method that mimics the environment of a building/factory that has been hit by an earthquake. The tasks performed on this stage include turning a valve, traversing difficult terrain, climbing a set of stairs, opening a door, cutting through a wall and driving a vehicle. All of these tasks force robot companies to consider the real application of their design and how it could be improved upon to better assist in a real earthquake disaster. The trial stage set up by Robolit and NIST in Charleston was designed to allow companies to come and practice DRC tasks before the final event that will be held in Pamona, CA. Dr. Komsuoglu is a robotics expert and entrepreneur with over 20 years of research, development and start-up experience. Focusing on biologically inspired high-performance mobility and high-dexterity manipulation systems Mr. Komsuoglu served as a key personnel in several critically acclaimed multi-institutional robotics projects sponsored by Defense Advanced Research Projects Agency (DARPA), United States Army Tank Automotive Research, Development and Engineering Center (TARDEC) and National Science Foundation (NSF). Some noteworthy projects he was involved with includes DARPA-CBS, DARPA-RHex, DARPA-RiSE, NSF-FIBR and MA-UGV. In these projects Dr. Komsuoglu engaged experimental robotic research, simulation, embedded system development (hardware/software), control systems engineering and analytic studies. Since 2006 Dr. Komsuoglu has been heavily engaged in business development. He founded and ran technology start-up companies focusing on commercialization of several robotic technologies he helped develop. In 2009 he founded Robolit LLC (https://www.robolit.com) providing design consulting for academic research equipment, search and rescue systems for first responders and military applications. His current work focuses on remotely controlled UAVs with a unique UI system employing virtual reality devices with applications in first response and entertainment industry. Since 2011 Dr. Komsuoglu has been serving as an active member of the DHS-NIST-ASTM Standard Robot Test Methods committee and is responsible of development of manipulation test methods. ©2017 Robolit LLC. All rights reserved.